In June, Goldfarb traveled to the 20th Maccabiah Games in Israel to coach the Maccabi USA Open Men’s Soccer Team. Photo special to the Journal. When Preston Goldfarb coached his last soccer game as a Birmingham-Southern Panther during the fall of 2015 then said goodbye to his world-class soccer camp the following summer, everyone assumed the book was closed on the legendary coach’s career. But another incredible chapter was yet to come. 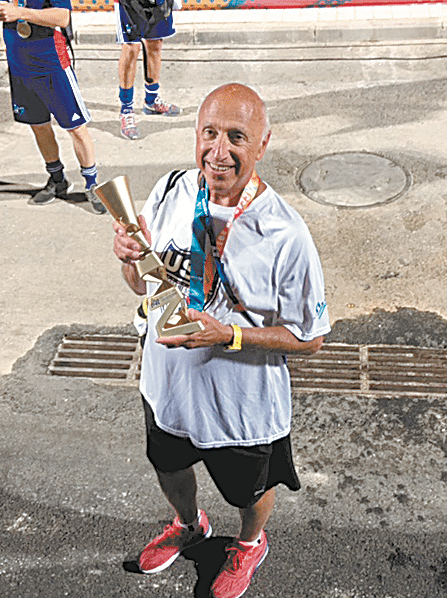 In June, Goldfarb traveled to the 20th Maccabiah Games in Israel to coach the Maccabi USA Open Men’s Soccer Team, his fourth stint coaching in an international event. He previously coached in the 18th Maccabiah Games in 2009, the Maccabi Australia International Games in 2010, and the 19th Maccabiah Games four years ago. The Maccabiah Games, often referred to as the Jewish Olympics, is a multi-sport event held every four years in Israel. The 2017 games brought together 10,000 athletes from 85 countries to compete in 45 sports, making it the third-largest event of its kind in the world. In the 2013 games, the USA team became the Impossible Dream Team by winning the first ever gold medal for a USA open men’s soccer team. This year, for the second time in a row, the USA team brought home the gold again – an unprecedented feat, since no other soccer team had ever won back-to-back championships in Maccabiah Games. For that achievement, they became known as the Forever Team. But it was also a notable win for other reasons. “It takes a special group of young men to be able to come together without ever playing as a team, with each other in only seven short practices, and make the kind of run we did to win it all,” said Goldfarb. Though the members of the USA team were named in late April, they didn’t meet until June 25, at the airport in Newark, New Jersey, on their way to Israel. Only 31⁄2 weeks later, they had collectively become a super-efficient soccer machine capable of taking on some of the best teams in the world and winning. Their final game was with what Goldfarb termed “a very good Great Britain team” that had beaten the USA team in group play. But when it mattered, the USA team prevailed. No one expected the USA team to win again this year, rendering victory even sweeter. At that exhilarating moment, Goldfarb’s coaching career was over. That doesn’t mean, however, there’s not an afterword to follow – a little icing on the cake, so to speak. And that is, indeed, the case with Goldfarb’s story. On Oct. 13, he’ll be inducted into the Birmingham-Southern Hall of Fame, and next April, he’ll join the likes of football great Ron Mix and basketball player-turned-team-owner Ernie Grunfeld in the National Jewish Sports Hall of Fame in New York. In the meantime, Goldfarb will finally be kicking back and enjoying retirement, walking his dogs every morning and working on a book about his youth. “That’s about it for now,” he said. For a guy who has spent the past 31⁄2 decades hustling up and down soccer fields, he seems perfectly pleased with the pace.